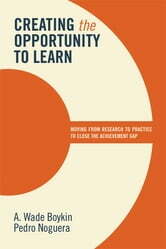 “Unless we believe that those who have more are inherently superior to those who have less, we should be troubled by the fact that patterns of achievement are often fairly predictable, particularly with respect to students’ race and class.”In Creating the Opportunity to Learn, Wade Boykin and Pedro Noguera help navigate the turbid waters of evidence-based methodologies and chart a course toward closing (and eliminating) the academic achievement gap. Turning a critical eye to current and recent research, the authors present a comprehensive view of the achievement gap and advocate for strategies that contribute to the success of all children.Boykin and Noguera maintain that it is possible to close the achievement gap by abandoning failed strategies, learning from successful schools, and simply doing more of what the research shows is most effective. Success is founded on equity, but equity involves more than simply ensuring students have equal access to education; equity also entails a focus on outcomes and results.If we want to bring about significant improvements in those outcomes, we have to do more to address the context in which learning takes place. In short, we must create schools where a child’s race or class is no longer a predictor for how well he or she might perform.